I had a good workout yesterday, swimming a mile and then hoping on the bike. My friend Bill wasn't in the parking lot when I got there so I took off with the fast group (or so I thought). After a couple of miles I figured out that wasn't "the fast group" that I had heard so much about and saw a rider several miles away. I broke away to chase him. And in classic Jimmy fashion - got lost. I turned around and was then wondering around for at least a mile trying to find the right road. The great thing about being lost here, is the fact that the area is absolutely gorgeous. So I was sipping on my custom cocktail of over-concentrated Gatorade, when all of a sudden I heard some screaming coming from behind me. The type of screaming that wasn't some high school girls yelling for fun, but from a bunch of guy's that were about to seemingly run over me. It seems the notorious "fast group" skipped the first loop and passed me going around 30 mph - up a hill! I didn't stand a chance, and it was too late for me to move to the side, so I just tucked in and prayed that I didn't get run over. Within a couple of miles I tried to chase them, to no avail. However, another group passed me, and I stayed with them for awhile. Then a guy bumped into me going into a curve. 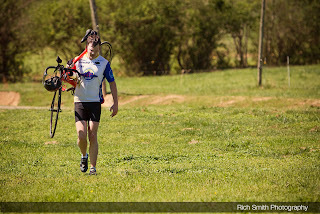 I'm not going to lie - I was TICKED - I chased after him, and then the guy quits! Are you serious? You have the gut's to try to knock me off my bike while we are racing and then you quit when we get into a dead-on sprint? I looked over at him, and he looked like he was about to call an ambulance to come pick him up. He had clearly just sprinted out of the gate with no endurance backbone (or manners). Anyway, from then on it was back and forth, from then on. Much to my chagrin, I still did not get the chance to climb Mowbry Mountain as I wasn't riding with a group and I was worried about sunlight. O well, I got some good riding in and was able to make it back in-time to go to Wallie World with my little girl and wife. It should be noted that I probably looked a little out of place, even in Wal-Mart, since my lips were turning blue and I was shivering due to the fact that I was still wet from swimming/cycling and I was drinking blue Gatorade. This weekend was packed with events. As usual, my training was seriously interrupted by a seriously erroneous weather report that called for a 90% chance of rain on Saturday and bright and sunny on Sunday. This is what I read on Friday night. Of course the opposite happened, as it was fairly nice weather on Saturday and thunderstorms on Sunday. Nevertheless, the weather didn't stop my friends from kicking some tail out there as my friends Bill, Brian and Michael ran the Country Music 1/2 Marathon and Kevin completed the Scenic City Triathlon. Although I was in Nashville on Saturday, I didn't brave the 50,000+ fans and runners to enjoy the race. On a personal note, I'm glad all of my friends did the 1/2 marathon as the full marathon was not every enjoyable for me and lacks the support that the 1/2 marathon does. I did wake up early and watch my friend Kevin compete in the Scenic City Triathlon. It was cold and wet, but it seemed everybody had a good time as there was a short swim, a slippery bike course and a rolling, but fast run set-up. Congrats again. On a more morbid note, my prayers and thoughts go out to the friends and family of Dave Martin, the triathlete in San Diego that was recently killed by a shark. Is it time to consider vegetarianism? This is a great post from the Clif Blog site that I thought I would copy here. I was actually a vegetarian in high school for 2 years. It's actually a long story as to why I made the switch, but I will tell you that I ran my fastest times and felt the best nutrition wise, while I was a vegetarian. Unfortunately, living in the South, it is very inconvenient, however like most things, I think it's worth it. It's actually interesting that I read this now. Two days ago at an Earth Day Festival I met a great guy that is highly involved in the Slow Food Movement. And starting June 1, there will be a challenge in Chattanooga to only eat local foods. The challenge is a part of Rock Point's book club and partly based on Barbara Kingsolver's newest book: Animal, Vegetable, Miracle: A Year of Food Life. Most of you will probably know her as the author of the Poisonwood Bible. It should be noted however that all vegetables and foods derived from vegetables are great. If you don't believe me, watch this movie! Just to clarify, the FDA regulates food labeling of prepared foods i.e. breads, cereals, canned and frozen foods, snacks, desserts, drinks. Frankly, their position on cloning, doesn’t interest me as much as the position the USDA might take on cloning. Ranching and meat regulation is, after all, the area of the USDA. You can comment on the FDA's actions regarding food labeling on their website. The best time to get involved is during their open public comment period. They make sure to address every comment—an added bonus! The USDA oversees agriculture and food policy, and food safety as related to farming and ranching. To me, the USDA is the more appropriate agency to evaluate and provide regulatory guidelines for something like cloning. The fact that they don't agree with the FDA's position says a lot. Keep tabs on the USDA, and all that they're up to on their website. Both of these websites are behemoths and if you dig you will find lots of intriguing and informative facts. You may learn more than you ever wanted to know, but you will be an informed consumer, which is what we need more of to advocate for our food supply! Like most people, my schedule has just exploded. I feel like spring just got here, yet summer is about to be over. Anyway, I wanted to do 3-state, 3-mountain, but other than doing a fairly long ride last weekend, I didn't think I had prepared enough. Additionally, my schedule is already full until 3-state. But yesterday, after-work I fixed the problem, with by climbing Lookout Mountain - TWICE! The second time was definitely the heart-pumper I needed. I even made it back in-time for bible study. So today, I signed-up, and god-willing, I WILL FINISH one of the hardest centuries out there. I hope everyone out there is enjoying the nice weather we are having in Chattanooga. 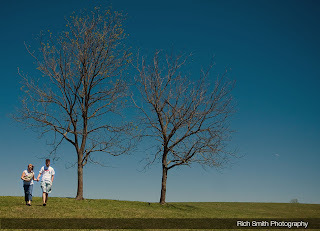 Thank you to Rich Smith Photography for the great pictures! Go to his site to see other photos from the day. Endurance Planet has a great podcast of Michael Wardian. Although I'm not as competitive as him, I resonated with him talking about how when you get married everybody tells you you will stop running and enjoying your hobbies, then when you have kids everyone says the same thing. I think I have gotten in better shape since I got married and had a kid. I'm looking forward to buying a chariot once our tax-refund comes in! The Aquaduct won this year’s Specialized/Google Innovate or Die contest’s grand prize. A five-person design team from Menlo Park, California designed this pedal-powered water filtration device to improve (and save) lives in developing countries. Watch the video or read more at www.treehugger.com. Those of you that know me, know that I am particularly happy with the fact that this innovation is related to water and will help end the needless deaths that occur ever year because of polluted drinking water. This is awesome 101 year old marathon runner that doesn't drink water, opting for beer and cigarettes instead! I had some pretty fun training on Saturday, albeit, cold and windy training it was. I started out at 8:00 an ran 6 miles into downtown to pick-up my bike. I then proceeded up Signal Mountain and then down through the Sequatchie Valley. I was pretty happy with my run time and climbing up the mountain, but I was disappointed once I got on top of the mountain due to the significant (30-40 mph) headwind. In any sense, it was a gorgeous ride. I plan on doing a hard day tomorrow. I'm not a big Tiger Woods fan as I only play golf a couple of times a year. However, I think this is a great interview with Scott Van Pelt for the ESPN Sports Center. SVP: “So there’s no point when you can sort of put the feet up on a Tuesday afternoon and say ‘Today I’m not going to the gym’.? Last week wasn't the best of weeks. I won't get into the details, but it wasn't that great. I was determined to make this a good week and so far, so good. On Sunday, my wife and daughter did their first 5K. I was the proud supporter on the sideline as well as a VERY CRITICAL VOLUNTEER. I was the back-up timer for the back-up timer. Everybody kept asking me: "why don't you run in it" to which I would reply - "but then who would be the back-up timer for the back-up timer?" Monday, I had a great ride up the mountain which was preceded my a great mile swim, then another ride, then a full 2 hours of lawn mowing and yard work - condo fee's don't seem that high after I think about it. Tuesday, I met with a friend who has done several Ironman's. It was extremely helpful - not one of those let me share my painful stories with you meetings but a meeting that I think will really help me come race day. I had another great swim with my friend I affectionately call Irish (who can swim faster with 1 arm than I can with 2) who gave me a couple of quick pointers, which helped my time and efficiency tremendously and then I was off to the Tuesday night ride. I'm either late or early and after multiple failed attempts I hadn't found a good group to ride with, but last night was a different story. I found my group and had a blast! I did interval work all through the beautiful rolling hills in the Tennessee Valley. In all, I biked over 40 miles yesterday after swimming my measly mile. Then a great friend of mine who I rode with introduced me to the best Japanese food that has ever touched my tongue. Much to the chagrin of my friends, I shunned the white sauce, but nevertheless, it was awesome! CNN.com is reporting today that the Olympic Torch has been extinguished during the Paris leg of it's around-the-world relay, as protestors lined the streets to demonstrate against the Chinese Government's recent actions in Tibet. According to the story, the Torch was extinguished and relit three times before along the route. The first time protestors near the River Seine forced Olympic officials to put out the flame, and then board a bus. Later, an athlete in a wheelchair was forced to douse the flame when demonstrators shouted at her along the route. The third and final incident came when officials saw the flame approaching a bridge where protestors were waiting for it's arrival. Back-up flames accompany the Torch on it's ritual relay, and the word is that the relay has once again resumed and was back on schedule. Todays demonstrations follow an equally challenging leg through London yesterday. The article notes that it is difficult to know for sure how many protestors were along the route, but their numbers were in the thousands. Some of those are believed to be Chinese supporters of the Olympics however. 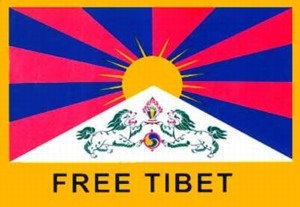 While I don't believe in violence for change, I am glad that there will now be more news on the oppression of Tibet. Hopefully, the country will truly be a free country in my lifetime. Yesterday I went on my first lunch time ride. I was a bit resentful, due to the fact that I have to change 4 times at work, if I want to workout during my lunch hour. But the weather was GREAT, and I know the only way I'll get faster on my bike is if I start riding with a group. I had an awesome time. I went out with some pretty fast guys and they showed me a new route, with rolling hills at the foot of Lookout Mountain, GA and through Happy Valley (yea, weird name, huh?). The good thing about these guy's is they are older and wanted to make good use of a measly one hour lunch break, so there wasn't really any talking, we were riding pretty fast. We covered 21 miles and it took right at an hour, which is a great pace for me, especially considering the rolling hills and traffic. Climbing Lookout Mountain has helped me considerably, just as running up Signal Mountain has helped me with my running. 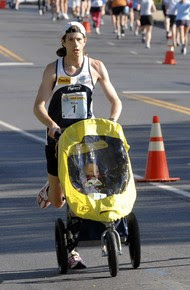 I once had a professor who claimed he qualified for the Boston Marathon by strictly running hills. I definitely think there is something to it. So far this is the best swim technique video out there. If anyone has any other suggestions leave a comment or email me. I was looking up some free swim technique videos on YouTube and found this. I love the end!